Sidney Mayor and President of the Ohio Municipal League Mike Barhorst and Shelby County Commissioner and President of the County Commissioners Association of Ohio talk with Ohio Supreme Court Chief Justice Maureen O’Connor following Wednesday’s meeting of the Task Force to Examine the Ohio Bail System. 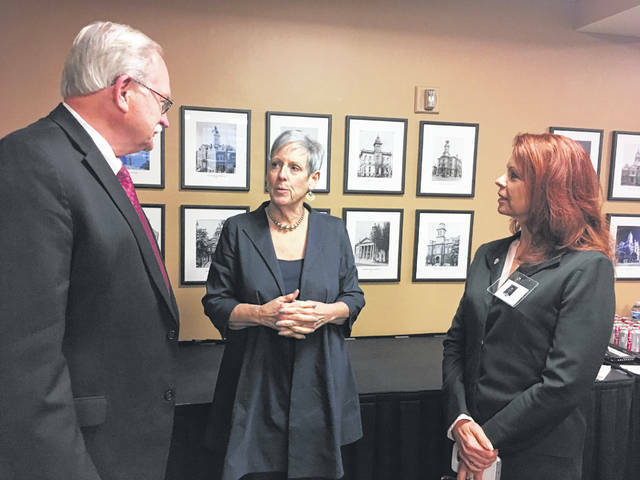 COLUMBUS — Sidney Mayor Mike Barhorst and Shelby County Commissioner Julie Ehemann attended their first meeting of the Task Force to Examine the Ohio Bail System on Wednesday, Jan. 23. The meeting was held in a conference room of the Thomas J. Moyer Judicial Center in Columbus. Barhorst and Ehemann were invited to join the task force as a result of their serving as president of the Ohio Municipal League and president of the County Commissioners Association of Ohio respectively. Barhorst and Ehemann join 22 other task force members, including Ohio Sentencing Commission Director Sara Andrews, Lawrence County Common Pleas Court Judge Andrew Ballard, Toledo Municipal Court Clerk Vallie Bowman-English, Cleveland Municipal Court Administrator Russell Brown, Fraternal Order of Police Chief Legal Counsel Gwen Callendar, The Buckeye Institute Legal Fellow Daniel Dew, Athens County Municipal Court Judge Todd Grace, Meghan Guevara representing the Pretrial Justice Institute, Rocky River Municipal Court Judge Brian Hagan, Cincinnati City Prosecutor Tim Horsley, Franklin County Municipal Court Judge Mark Hummer, Oriana House President James Lawrence, Ohio Bail Agents Association President Charles E. Miller, Ohio Department of Mental Health and Addiction Services Chief of Criminal Justice Services Christopher Nicastro, ACLU of Ohio Assistant Policy Director Jocelyn Rosnick, Cuyahoga County Common Pleas Court Judge John Russo, Ohio Association of Pretrial Services Agencies Tom Sauer, Buckeye Sheriff’s Association President Sheriff Larry Sims, Ohio Association of Criminal Defense Lawyers President Michael Streng, Pickaway County Prosecuting Attorney Judy Wolford, and Timothy Young, representing the Office of the Ohio Public Defender. Montgomery County Common Pleas Court Judge Mary Katherine Huffman is serving as chair of the task force. The Supreme Court of Ohio Chief Justice Maureen O’Connor asked the task force to meet to review and recommend improvements to Ohio’s current bail system. During the process, the task force will study the bail and pretrial systems used in other states; review any federal or state litigation pertaining to the use of bail and/or the elimination of cash bail; determine whether the courts should require the use of a pretrial risk assessment tool, and if so, whether that tool should be a validated tool; review the use and utility of bond schedules; and, review Ohio’s bond practices to determine the appropriate balance between recognizance bonds, pretrial monitoring, and cash or secured bonds.